caused a sudden power outage. Passengers at Hartsfield-Jackson Atlanta International airport were left in the dark when the lights went out around 1pm on Sunday. All outgoing flights were halted, and arriving planes were held on the ground at their point of departure. 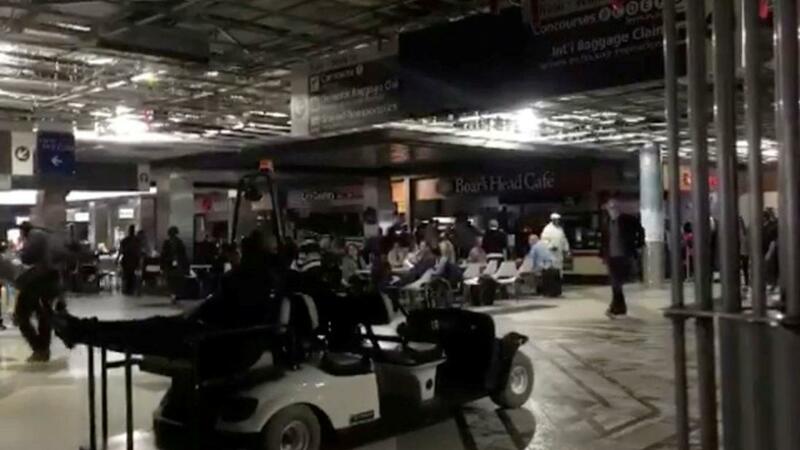 More than 10 hours after the blackout began, authorities announced that power had been resorted to some areas of the airport. The City of Atlanta said on its Twitter page that it was providing a shuttle service to the Georgia Convention Centre for passengers needing somewhere to stay and would provide a meal from Chick-fil-A. Passengers were forced to sit on planes for several hours before they could be disembarked back into the airport. Emilia Duca, 32, was on her way to Wisconsin from Bogota, Colombia, when she got stuck at the airport. She said: "A lot of people are arriving, and no one is going out. No one is saying anything official. "We are stuck here. It's a nightmare." Another stranded passenger, Rutia Curry, said elderly or disabled passengers were left stranded. She said: "They had these elderly people, handicapped people lined up in wheelchairs. The people were helpless, they can't get down the stairs, it was just a nightmare." Delta, which has its biggest hub operation in Atlanta, was hardest hit by the disruption. It cancelled almost 900 flights on Sunday and another 300 on Monday. United Airlines also warned on social media that travel could be affected on Monday. The disruption comes at the start of the busiest travel weeks of the year ahead of the Christmas holidays. Passengers have been warned the delays could last into the week due to a lack of open seats on other flights. A statement from Georgia Power said the cause of the fire which triggered the outage was unknown. It said: "No personnel or passengers were in danger at any time." It added that there are "many redundant systems in place" to ensure the power supply to the airport, and that blackouts are "very rare".